VIDEOGAMESPLUS.CA: LAST STORY Wii Pre-Orders Open! 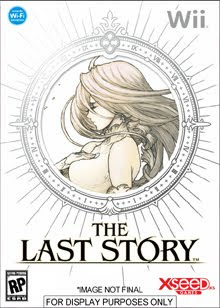 We have opened up pre-orders on The Last Story - Wii (Preorder) . XSEED has decided to release this highly sought after RPG in North America on June 19. 2012. The Last Story marks the reunion of two luminaries that helped shape the RPG genre; legendary creator Hironobu Sakaguchi, and internationally-recognized composer Nobuo Uematsu. Gorgeous pre-rendered cut-scenes help convey the full emotions of key story sequences in an epic tale of survival against the odds. The genre is also advanced with an innovative real-time combat system involving strategic party-based commands that include taking cover from enemy fire, destroying environments to gain a tactical advantage, and drawing fire away from your allies to give them time to cast powerful support spells. Once the battle system is mastered, players can test their skills online where co-op and versus mode for up to 6 players can net special rare items.